CEDAR CITY — When Jessie Bolton was in elementary school, she was a victim of bullying. When she wasn’t being bullied, the other kids just didn’t talk to her at all. Now an eighth-grader at Cedar Middle School, Bolton is a member of the “Student Ambassadors” program, working to not only help other kids who have been bullied but also the students doing the bullying themselves. According to the Utah Anti-Bullying Coalition, approximately 1 in 5 kids is affected by bullying, and more than half of students witness some form of bullying every day. A recent poll from Dan Jones & Associates asked 625 Utahns to rank how much they believe bullying is a problem in public schools. 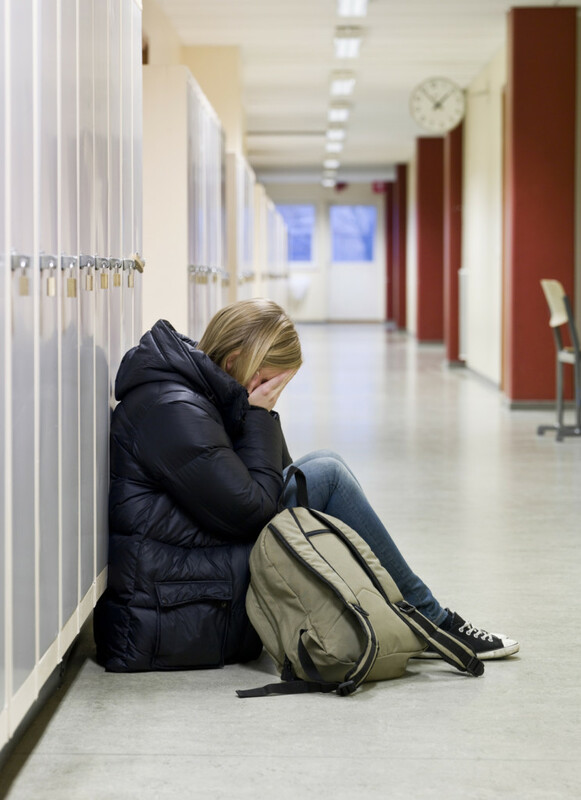 Over two-thirds of respondents said they believed it was either a “serious problem” or “somewhat of a problem.” When it comes to bullying in junior high and middle school specifically, those results increase to 80 percent. Cedar Middle School Principal Bylynda Murray has been in education since 1997, during which she has been both an educator and administrator. Murray said she isn’t sure if bullying in general is more prevalent than it has been in past years or if the public is just more aware and sensitive to the issue. However, she said, she believes given the changes adolescents are going through during their middle school years, the effect is amplified. This is where the Cedar Middle School Student Ambassadors program enters the picture. Patterned after a similar program at Sunset Ridge Middle School in the Jordan School District, the Student Ambassador program at Cedar Middle School is in its second year, and school counselor Ashley Whiting said the whole school has supported the program. Referring to herself and seventh-grade teacher Neena Mathews, the other Student Ambassador adviser, Whiting said they are really just there to support the ambassadors. CMS Ambassadors are a community of student representatives that lead, encourage and promote a positive and comfortable atmosphere for all students. We exemplify and empower fellow students by teaching skills and strategies that will help to develop character and inspire a respectful school culture. We strive to help all students feel comfortable and make CMS a better place. All who enter our doors will be accepted and welcomed. Each quarter, the ambassadors pick a different focus with various support activities. 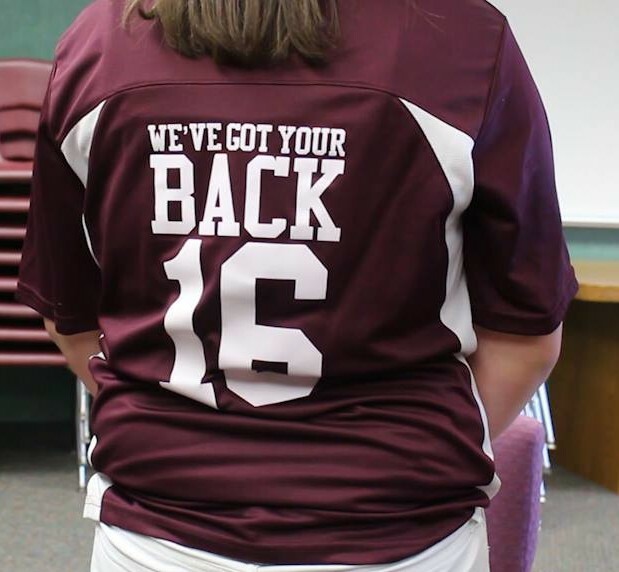 Whenever the ambassadors are conducting or attending one of the activities, they sport a jersey designed by the group with the motto “We’ve got your back.” Seventh-grader Kailey Gilbert said the jerseys were part of an overall effort to show their peers that Cedar Middle School is a team. Gilbert, who is one of the Student Ambassadors in charge of the first quarter campaign — Warriors Against Bullying — said the jerseys went along very well with the anti-bullying campaign, which involved a “bracelet ticket” containing three activities for students to complete. To receive a bracelet, students watched and discussed an anti-bullying lesson and slideshow, participated in the “Have the courage to take a stand” anti-bullying bingo lunch activity and signed a banner pledging to never bully others or to stand up to those who do. Jessie Bolton was one of those students who was on the receiving end of bullying previous to joining the Student Ambassador program. I didn’t ever realize that the person who was bullying had problems in their life and things about themselves that they didn’t like. I always thought that they were very confident and just wanted others to feel lower than them, and I didn’t know that they also had things going on. So I want to be able to also help the bullies to not bully. Principal Murray said that while students have a wide range of adults they can approach at the school, a lot of potentially bad situations during the school year were avoided because of the Student Ambassador program. When students get bullied, they’re kind of nervous to go to counselors because they’re afraid of what they (counselors) are going to think. … We’re not just some counselor you can go to; we’re students. We’re fellow friends, so people can come to us and they don’t feel like we’re going to judge them. Even though not all of the Student Ambassador activities are geared toward bullying, eighth-grader Dalton Gronning said that was the main reason he wanted to be an ambassador. While Gronning acknowledged that bullying isn’t something unique to his generation, he said he hopes that through his actions and those of the 27 other Student Ambassadors, they can work toward making the situation better.